If you wind up just one ball of your new yarn before you loan your ballwinder to a friend, and you make a really quick gauge swatch, and it turns out perfectly, you are supposed to start the sweater right away even if you already have a million projects in progress, right? 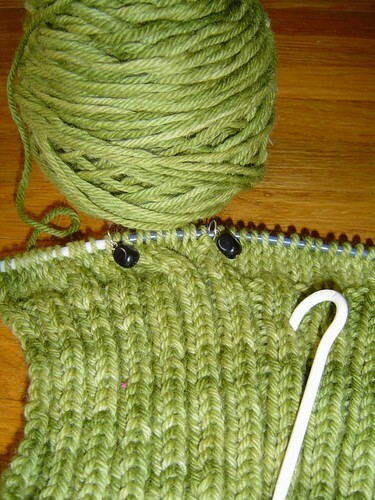 The beginnings of my Central Park Hoodie out of Arucania Nature Wool just acquired at stitches west. First use of my lovely Zero Stitch Markers. 8 Responses to "A quick beginning"
I think that’s going to be one nice CPH! Well, duh. What choice did you have? Of course you should! That would mean that you were asking for the Knitting Goddess to smack to down…and you CERTAINLY don\\\\\\\’t want that! Hey Karrie – I just started this sweater too, even though I still have to finish my second knee sock, and my cabled scarf, and a second sock for my husband, and a sweater for myself that i resurrected from the UFO pile last week and started seaming. Saw your post on the CPH KAL site and just had to bop on over and visit you. Sweet CPH! Love the Arucania’s greeny green greenness. I have that yarn in the stash and I almost bought more at Stitches!! !